At a NATO summit in Brussels with top EU leaders, President Donald Trump scolded Germany, and vowed to put an end to the country’s hefty car exports to the U.S., multiple German and now English-language news outlets report. German newspaper Der Spiegel cites “a circle of participants” at the summit, who claim Trump had harsh words to say about what he claims is Germany’s trade imbalance with the U.S. The Germans are bad, very bad... Look at the millions of cars they sell in the US. We will stop this. The Sueddeutsche Zeitung also reported in German a similar “bad, very bad” quote, and ZDF also said that Trump was displeased with Germany’s heavy automotive trade surplus to the U.S. The same has been quoted by Slate and Quartz, among others in the U.S. too. These comments are in keeping with some of the other rhetoric Trump has been spewing about foreign carmakers. On the campaign trail he regularly targeted companies like Toyota, threatening them into making cars in the U.S.—which many of them already do. 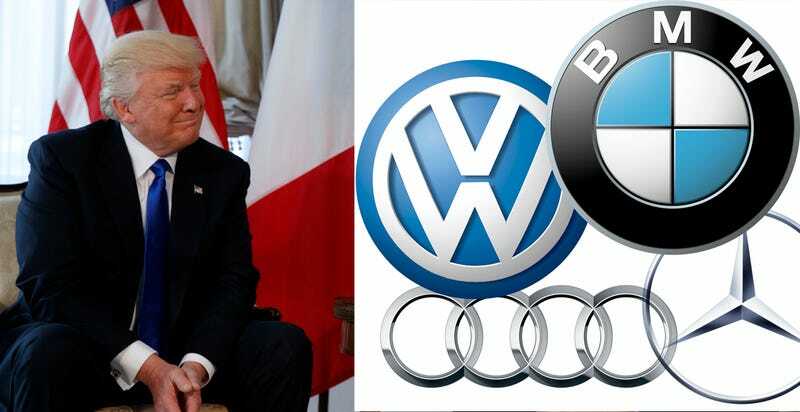 In this case BMW, Mercedes and Volkswagen all have substantial manufacturing bases in the U.S.; BMW alone makes all of its SUVs in South Carolina. According to MIT’s Observatory of Economic Complexity, a visualization tool for international trade data, Germany has a $252 billion positive trade balance, with the majority of goods being cars, which make up 12 percent of all exports. The top destination for German export goods, the OEC shows, is the U.S., representing 9.9 percent of all export value, or $122 billion. It’s worth noting that Donald Trump is clearly a fan of German cars, as the only video we’ve seen of him actually driving shows him behind the wheel of a Rolls Royce, which is built by BMW.